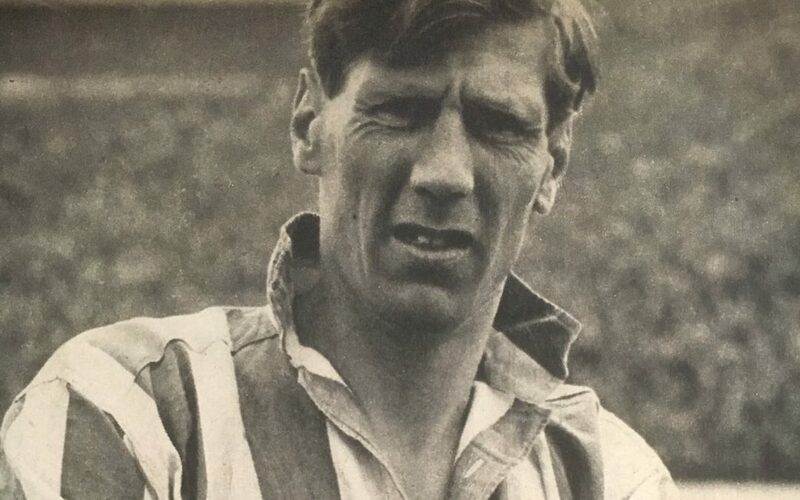 Notts County’s surprise reign as the biggest spenders in British Football lasted a mere three months before it was topped by £500 when, in February 1948 Sunderland paid local rivals Newcastle United £20,500 for LEN SHACKLETON. Bradford-born inside-left Shackleton’s formative years were spent kicking a ball around at every opportunity. When no football boots were available his Uncle John came to the rescue. “I couldn’t afford real football boots” he would later recall. “So my Uncle John bought some studs and hammered them into an old pair of shoes”. Chosen to play for the North against the Midlands in a schoolboy match, Shackleton impressed and was soon pulling on an England schoolboy shirt. He played in three schoolboy internationals scoring twice on his debut and being a key part of a team that won all three games, scoring 18 goals. Arsenal manager George Allison was alerted of the youngster’s talents and drove north to sign him with his parents agreeing tao the move while ‘Young Leonard’ stood by and listened. “He had no need to sell the club to me” Shackleton would later say, “At that time any 15-year-old- boy, invited to join the greatest club in the world, would have been out of his mind to think twice”. Shackleton moved down to London and Allison sent him out to play for the Gunners then-nursery club, Athenian League Enfield on loan while working on the Highbury groundstaff. He made two appearances for Arsenal reserves before, in May 1939, the Gunners boss told him he was too frail and released him. 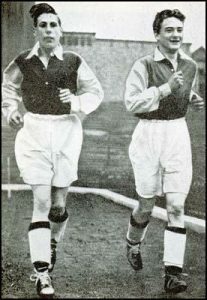 Although he said Allison ‘couldn’t have been kinder’ when releasing him, the words; ‘You’ll never make it as a professional footballer’ must have stung and Shackleton was undoubtedly upset by his treatment at Highbury and later intimated that he was treated as a ‘country yokel’ by the North London giants. Shackleton initially stayed down south, finding work in a Kent paper mill and playing for the works team. 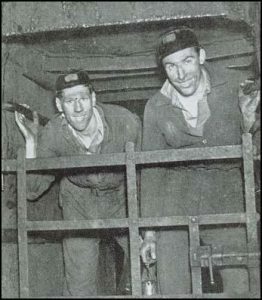 He returned to Bradford at the outbreak of war and found work assembling aircraft radios for GEC before becoming a ‘Bevin Boy’, working in the mines whilst also turning out regularly with Bradford where his reputation rapidly grew. He had volunteered for the RAF while employed by the electrical company but was turned down as his work was considered too important. Shackleton re-signed with Bradford Park Avenue and played for them throughout the war with his reputation growing steadily. Soon after the war ended Shackleton was chosen to represent his country alongside Tommy Lawton and Jimmy Hagan in a victory international against Scotland at Hampden Park. In front of 139,468 fans, his team lost 1-0 and ‘Shack’ gave away the free-kick that led to the only goal from Jimmy Delaney, enduring a disappointing first apoaearance on the big stage. Despite this he was a wanted man and Bradford got £13,000 for Shackleton from Newcastle. He had become disenchanted with criticism from Park Avenue fans over his individual style and played just seven 2nd Division matches for the club in peacetime. On hearing that he had been transferred, Stanley Matthews said; “This is more proof of the harm unsporting spectators can do to players and clubs”. 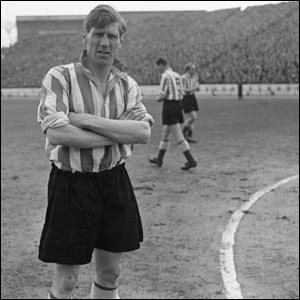 At St James’ Park he was came in as a direct replacement for Albert Stubbins who had been sold to Liverpool for the same amount. He made a remarkable debut for his new team, scoring six times in a 13-0 in a Second Division win over Newport County. 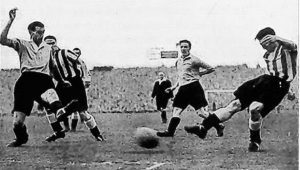 With a forward line that included Jackie Milburn, Charlie Wayman and Roy Bentley as well as Shackleton, Newcastle had no trouble scoring but their defence wasn’t so good. They finished 5th in the Second Division in his first campaign there and reached the F.A. Cup semi-final where they were thumped 4-0 by eventual winners Charlton Athletic. Milburn for one was critical of Shackleton’s cavalier style saying; “He was ever the showman. Shack always preferred getting applause for doing some daft trick rather than scoring a straight-forward goal”. Despite this, ‘Wor Jackie’ added; ‘I clicked with him because I always expected the unorthodox”. Meanwhile teammate and future United manager Joe Harvey is reported to have said; “Newcastle would never win anything with him in the team” and claimed that he was more of a crown entertainer than a team footballer. Shackleton’s new club almost swapped places with the old one. Whilst Newcastle would go on to win a place in the top flight, Sunderland avoided relegation by a single place. 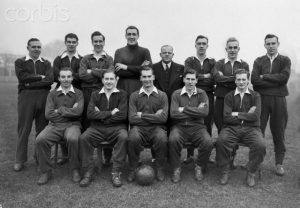 Sunderland were big spenders during the 1940s and 1950s, becoming known as ‘The Bank of England’, but the collection of good individuals failed to gel as a team. 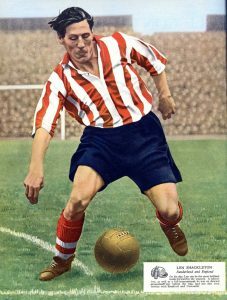 Trevor Ford – who we’ll come to in a future article in this series – was brought in to partner Shackleton up front and after one falling out said he’d never play in the same team as him again, a comment he later retracted. To say the relationship between the pair was frosty would possibly be understating it. Ford often complained that the only times Shackleton passed to him would be with backspin on the ball making it difficult to control. One time during a friendly in Holland he dribbled through the defence before passing to the Welshman and offering a simple tap-in with the comment; ‘Don’t say I never pass to you’. Shackleton had sublime skills and was a player fans, even those of opponents always enjoyed watching perform. One journalist said of him at the time; ‘He has adhesive ball control and a breathtaking body swerve. And his slender legs could crack the ball like a Bofors gun’ whilst a fellow pro remarked; ‘Once in his possession the ball is his slave. His nickname as ‘The Clown Prince of Soccer’ underlined that he was always an entertainer (he once put his foot on the ball in the opposing penalty area and mimicked combing his hair and checking his watch) but the end results were often frustrating. Entertainment seemed to often get in the way of results all of which led to a career where he received many plaudits but few rewards. During his time at Roker Park Sunderland would finish First Division runners-up once and reach two F.A. Cup semi-finals but they were on the wane and had become embroiled in an illegal payments scandal when he retired after playing once at the start of the 1957-58 season. He ended with no major team honours to show for his time in the game. 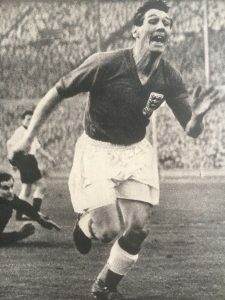 Shackleton played five times for England, scoring only on his final and best start when his country ran out 3-1 winners against World champions West Germany in 1954. He was then 32 and was only chosen after several withdrawals and the goal came when he lured the opposing ‘keeper out and audaciously chipped him. Stanley Matthews was in the team that day and would later say in his autobiography that Shackleton was; “Unpredictable, brilliantly inconsistent, flamboyant, radical and mischievous; in short, he possessed all the attributes of a footballing genius which he undoubtedly was”. 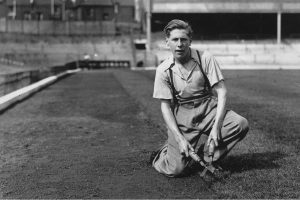 He had made first appeared In an ‘official’ international in 1948 and seemed set to become a regular he was left out of the squad for the 1950 World Cup. When questioned about his regular omissions for the national team, one selector allegedly retorted; ‘We play at Wembley not the London Palladium’. During his career he had a barber’s shop in Sunderland but on retiring Shackleton worked as a journalist for the Daily Express ans Sunday People and wrote his autobiography, aptly called ‘The Clown Prince of Soccer’. 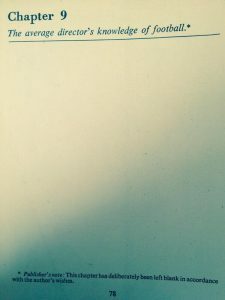 One chapter titled ‘The Average Director’s Knowledge of Football’ was a blank page. Len Shackleton can lay claim to being the original ‘maverick’. Any number of players since have been heirs to that title and many, including Paul Gascoigne, were championed by him. His approach to the game clearly produced tremendous entertainment to thousands of people on a weekly basis but had little end result for the clubs he represented. Shackleton would hold the title as the United Kingdom’s most expensive player for a year before being usurped by another inside-forward.